Well March & April came and all in all was very wet indeed. I haven't been able to properly get into the garden to do any planting. Although I did buy 6 Fuchsia plants from the local supermarket and having spent a few weeks on the kitchen windowsill, they've made their way out into the garden. I'm having to keep them sheltered at night because we've had a couple of ground frost nights. But they've grown so fast and sturdy, I'm hoping they grow to be huge beautiful plants. 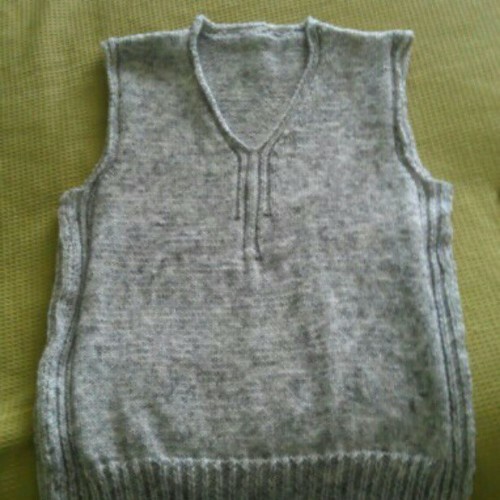 Whilst Ive not been able to get outside though I have managed to finish hubby's sleeveless sweater. Halfway through I have to admit I was getting quite bored with it, but once it was finished I was eager to start other projects. One of my many "to-do" knitting projects was to knit some things for Christmas. Yes you read right!! It's only May and already I'm thinking about Christmas. Well mainly the present & knitting project part anyway. I made this little Humpty Santa when my eldest was a baby & somewhere along the way it's disappeared. Well I've made him again, in an afternoon, whilst watching the complete season of Merlin. He currently needs a face, I have no felt at the moment, but I'll knit Mrs Claus ready anyway to join him and it won't take a second to add the facial features. 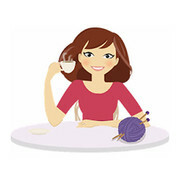 I've recently subscribed to a monthly knitting magazine and as part of the subscription I received a complete set of Knit Pro Interchangeable Circular Knitting Needles. I'm so chuffed with them and although a little daunted about using circulars, I'm also excited about having the tools to be able to finally knit something "in the round" as they say.